Emerson SolaHD™ Uninterruptable power supply employs four 12-Volt 5 Ah valve-regulated non-spillable lead acid battery for ensuring reliable performance. It allows you to add-on batteries for extended backups. It has higher output power factor of 0.9, power rating of 1000 VA/700-Watts and input voltage rating of 120-Volt AC. Power supply featuring 10-ft cable, has 5-15P input and six 5-15R output connection. This small 2U uninterruptable power supply measures 3.5-Inch x 17-Inch x 21.5-Inch. 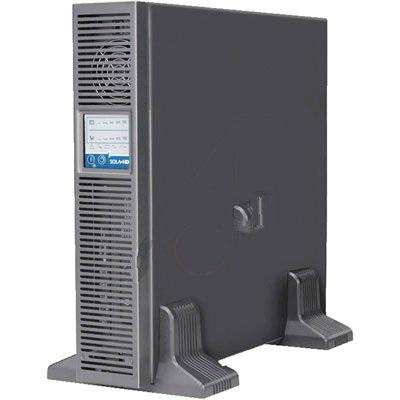 It supports rack and stand-alone tower mounting for making installation easier. Power supply has hardwire capability that allows to make permanent installation. This field configurable power supply is perfect for standby generators, industrial automation systems, critical microprocessors, PC based systems, robotics/process control, programmable logic controllers, high-speed networks, enterprise telecommunication systems, medical diagnosis equipment and publishing machinery. It is compatible with most standby generators. It withstands temperature rating of 0 to 40 deg C. Power supply is UL/cULus listed, ANSI certified and meets IEEE standards.